The human body has got three major salivary glands, including the Parotid Gland, the Submandibular Gland and the Sublingual Gland. These are all the exocrine glands which have a duct for the salivary supply. Commonly for all the salivary glands, the entry and exit of the blood vessels and nerves is at the hilum and the glands are divided into various lobules. This is the largest of all the salivary glands, and is located in the retromandibular area and extends in front of the external ear, being wrapped around the mandibular ramus and being placed in front of the external auditory meatus. The gland is roughly of wedge shape both superficially and when seen in horizontal sections. This is compound, branched alveolar gland. Excretory Duct – The main duct that secretes the saliva from the Parotid Gland is called Stenson’s duct, and it opens in the vestibule in a papilla lying opposite to the maxillary second molar tooth. It is a pure serous gland though in new born mucous acini may be seen. The parotid gland is well capsulated, and there are long and narrow intercalated ducts present in it, while the striated ducts are prominent in it. The parotid gland has four surfaces – superficial or lateral, superior, anteromedial and posteromedial. Blood supply: External Carotid artery via the posterior auricular artery and the transverse facial, and the venous return is through the Retromandibular vein. Nerve supply: The Parotid gland’s nerve innervation is totally autonomic, and the Postganglionic sympathetic fibers from superior cervical sympathetic ganglion reach the gland as periarterial nerve plexuses, going around the external carotid artery. The Submandibular gland, also called the submaxillary gland is a gland that lies beneath the floor of the mouth. 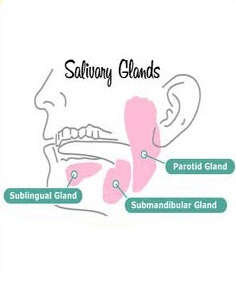 About 70% of the salivary volume in the mouth is contributed by the Submandibular gland. The gland lies in the submandibular triangle superior to the digastric muscle, and is divided to superficial and deep lobes separated by mylohyoid muscle. It is a compound branched, alveolotubular gland. Excretory duct : Wharton’s duct opens on papilla on the floor of the mouth at the side of the lingual frenum. It is a mixed gland, serous elements predominating and it is well capsulated. Blood supply: The blood supply to the Submandibular gland is through the facial and lingual arteries. Nerve supply: Parasympathetic innervation to the submandibular glands is provided by the superior salivatory nucleus via the chorda tympani, a branch of the facial nerve, while the direct regulation is done by the sympathetic innervation. The Sublingual gland is a salivary gland lying anterior to the submandibular gland beneath the floor of the mouth, at the sublingual fold. It is a mixed gland, mucous elements predominating. It is a compound branched, tuboloalveolar gland, and it is not capsulated. Excretory duct : Bartholin’s duct opens near the opening of the submandibular gland duct opening and draining through the sublingual caruncle. There are around 8-20 excretory ducts called the Ducts of Rivinus. Nerve supply: The chorda tympani nerve (from the facial nerve via the submandibular ganglion) is secretomotor to the sublingual glands.